This post is about top 3 most effective natural ways to get rid of dark circles under the eyes. Dark circles are one of the skin problems that are very common in all age groups. There are many causes behind dark circles such as insufficient night sleep, imbalance diet, anxiety, less intake of water, smoking, alcohol intake, and illness etc. However, you can reduce dark circles easily by simply watching your sleep, diet, and eliminating smoking habits. Follow these simple tips along with home remedies to cure dark circles. Drink 8-12 glass of water. Sleep for 8 hours at least. Eat leafy green vegetables e.g, spinach. Quit smoking and taking alcohol. Do not take stress. Be relax. Apply and good quality eye cream. Fix nasal blockage as it causes dark circles. Exercise at least three times a week to improve blood circulation. Since natural remedies are easy to apply and inexpensive therefore, you can try these effective natural cures for treating dark circles. 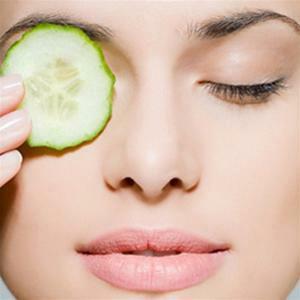 Cumber slices or cucumber juice is considered very much effective for lightening dark areas under the eyes. Just take cucumber slices and place on eyes for 15 minutes it will refresh your eyes. Or you can extract cucumber juice, dip cotton balls in and place these balls on eyes for 15 minutes. Extract raw potato juice and add 1-2 drops of lemon juice in it, soak cotton balls in it and place on eyes for 30 minutes and wash with luke warm water. 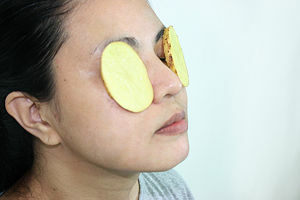 You can also keep potato slices for 30 minutes on your eyes. Green tea is known for weight loss and is full of antioxidant. Dip a green tea bag in warm water and let it cool. Now soak cotton balls in it and place it on eyes for 15-20 minutes. 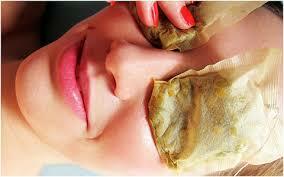 Or you can keep use tea bags on eyes as well.